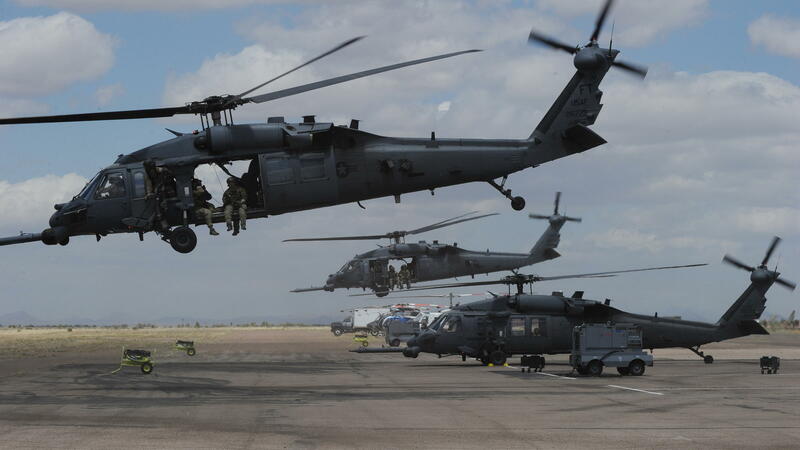 Air Force HH-60 Pave Hawk helicopters shown during Exercise Angel Thunder, in Arizona's Sonoran Desert, in 2010. A Pave Hawk crashed in Iraq on Thursday, killing seven people. "This tragedy reminds us of the risks our men and women face every day in service of our nations," he said. "We are thinking of the loved ones of these service members today." The statement said that "An accompanying U.S. helicopter immediately reported the crash and a quick reaction force comprised of Iraqi Security Forces and Coalition members secured the scene." Names of the service members were being withheld until next of kin have been notified, it said. NPR's Jane Arraf reports that Iraqi military officials believe that the helicopter went down due to a mechanical fault. "The U.S.-led coalition battling Islamic State insurgents in Iraq and Syria have an outpost in Qaim, which is located near the Syrian border. The anti-IS campaign accelerated through much of last year, as coalition and Iraq forces battled to take back a string of cities and towns. "Prime Minister Haider al-Abadi declared victory over IS in Mosul in July. In the following months Iraqi forces retook a handful of other IS-held towns including Tal Afar in August, Hawija in September and Qaim in October. In November, Iraqi forces retook the last Iraqi town held by IS — Rawah, near the border with Syria."